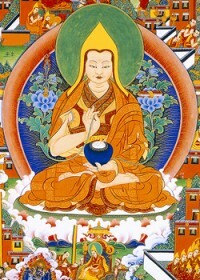 The Great Stages of the Path to Enlightenment Je Tsongkhapa's Lam-Rim Chen Mo or The Great Treatise on the Stages of the Path is one of the most renowned Tibetan Buddhist classics. The work falls into the Lam-rim genre which stemmed from the Kadampa school of Tibetan Buddhism. Its main structure is based on the division of three levels of spiritual beings, which Atisha puts forth in The Lamp for the Path, and the three principles of the path.